After break-ins, thefts and shattered glass in May and June – and an assault on the church facilities manager, who was not injured seriously – the string of petty crimes at Bethlehem Lutheran Church, outside the nation’s capital in Fairfax, Virginia, took an unexpected, terrible turn. Near the end of June, one or more intruders attacked the sanctuary, writing swastikas, anti-black and -Semitic slurs, and “You’re all going to hell” on the walls behind the pulpit, breaking more glass, and slicing deep gashes into the upholstery of every seat. The Rev. 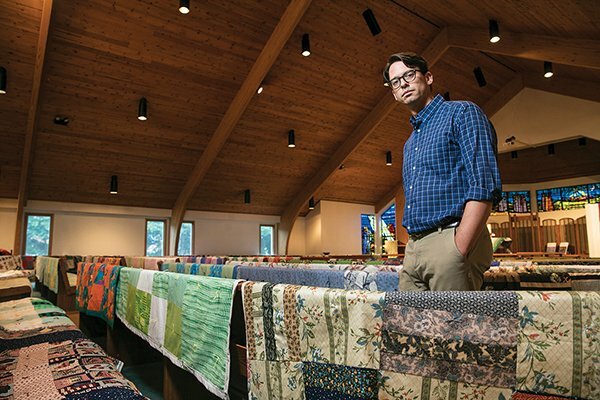 Dan Roschke ’00, MDiv, saw the display of hatred at his new church right after his move from San Diego with Heather (Embree ’97) Roschke and their two children. The words could not be unseen. At least one member of the congregation was too terrified to return for a time. At least one family couldn’t explain the events to their children and also stayed away. Everyone wondered what might come next. “Hatred is real, and it’s closer to us than we’d like to or always acknowledge,” said the seventh-generation pastor, a biology graduate who intended to become a doctor before deciding on Lutheran seminary. The quilts began to arrive in many colors and shapes. There were new quilts, tattered quilts with only one use left in them, and even a set of long quilts specially manufactured to cover church pews. Quilts also hang on the walls that were defaced. Since the defacing of the sanctuary, Lutheran Social Services has set up its regional office to support immigrants and refugees inside the church building.